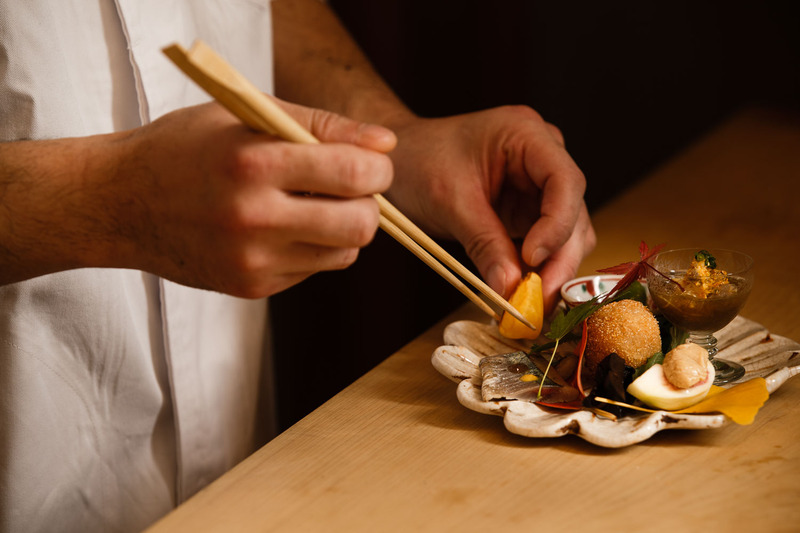 Committed to creating dishes he can truly call his own, the young and humble chef of Oryori Tsuji is on a mission to seek new ways to savor Japan’s seasonal delicacies. The subtle yet beautiful combination of ingredients, flavors and techniques is what makes this little one-star find so unique. Set in a quiet traditional ambience, every detail from architecture to tableware is curated to complement the sophisticated culinary experience. Just within months of opening in June 2017, the restaurant quickly won a Michelin star for its original menu that marries traditional methods with rare produce. 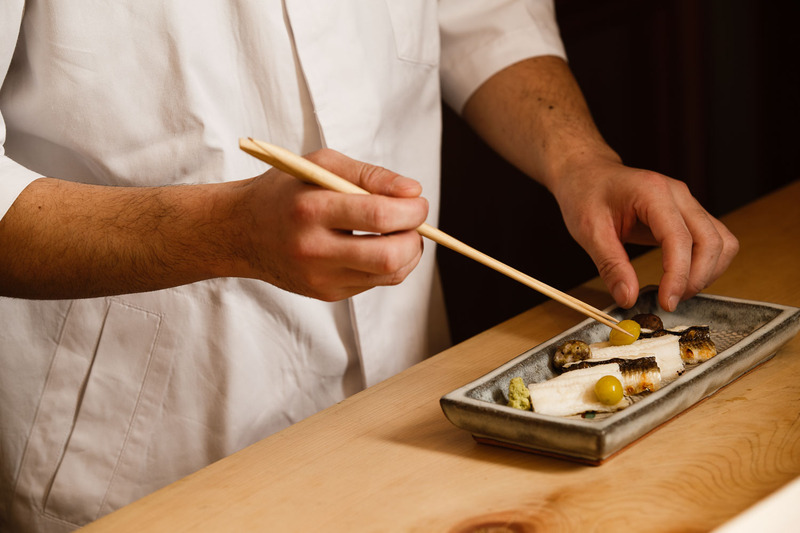 Despite being just 35 years of age, Chef Yoshiaki Tsuji’s rich experience at top restaurants like Tokyo Kitcho and Seisoka has allowed him to imagine and create incredible recipes. 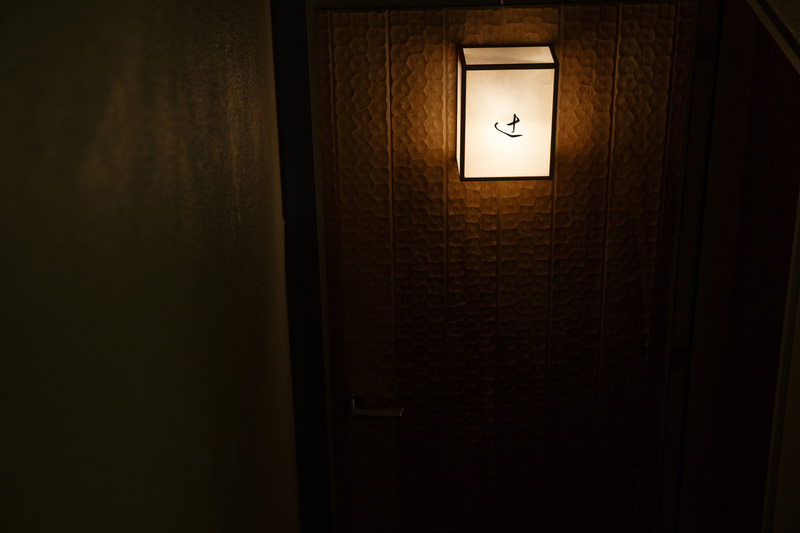 Oryori Tsuji is found on a quiet corner in the upscale neighborhood of Higashi Azabu. Situated inside a residential condo, you feel like you are finding your way to a secret restaurant, lit with a small lantern with the restaurant’s name by its entrance. Once you step inside into the quiet lounge, it feels like you’ve magically transported yourself somewhere far outside the busy city. The wide hinoki wood counter that stretches in front of the kitchen sits just six guests. 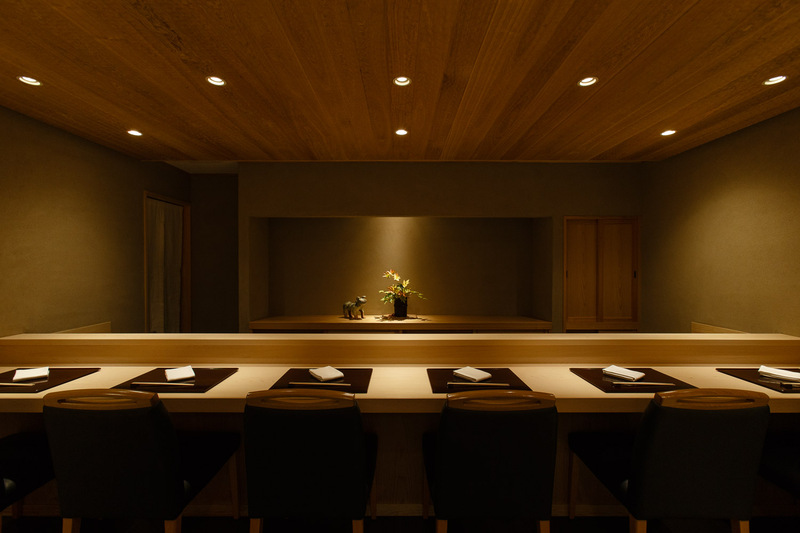 The smooth wooden ceiling has been given a naguri finish, a traditional method of chipping and shaving wood. The walls are made of juraku, composed of natural sand, straw and clay. The floor is beautifully tiled using old craftsmanship. There are also two private rooms, both with windows to gaze at the views of the four seasons outside. 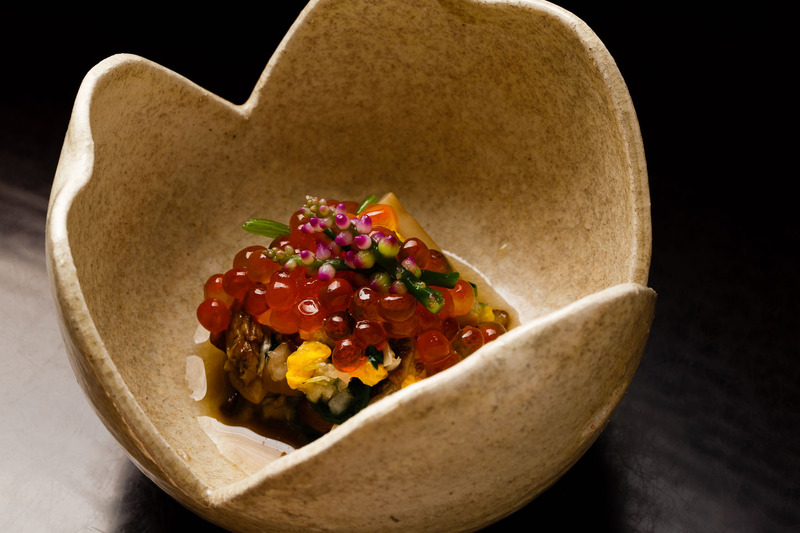 While the core of its ambiance is traditionally Japanese, Tsuji adds his own style in making his restaurant unique. For example, one of the displayed artifacts is a little statue of the dog from the zodiac calendar, made during the Han dynasty in China. He also arranges all the flowers in each room of the restaurant every day as a way to show his welcome to his guests. From the start, Tsuji’s cuisine will surprise you with new ways to enjoy seasonal flavors. The opening appetizer mixes an assortment of wild mushrooms and is topped with a generous scoop of juicy and sweet salmon roe. The unusual combination is not only beautiful to look at but introduces a fresh combination of tastes and texture. Beautifully curated on a flower shaped plate is a parade of seven seasonal appetisers from dressed salads to fried delicacies. 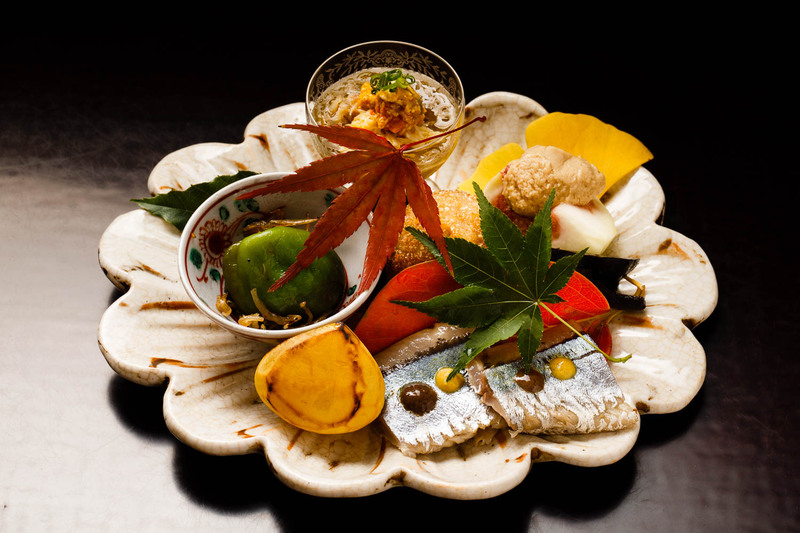 The day’s hassun includes chestnuts in syrup, crab and mozuku seaweed, figs dressed with sesame dressing, smoked Pacific saury and little potatoes fried with rice cracker batter. Among many devout fans, the soup is their ultimate favorite at Oryori Tsuji. 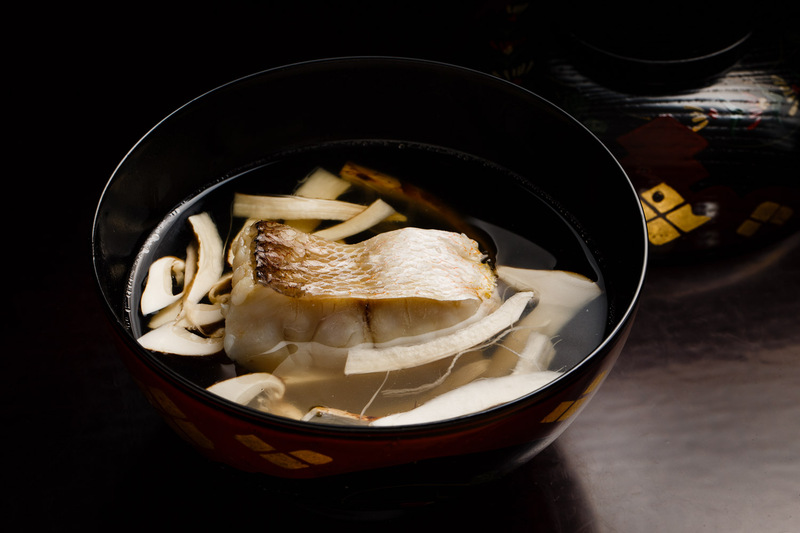 Using clear dashi made by brewing kombu flakes for more than eight hours, the broth is incredibly rich in umami. 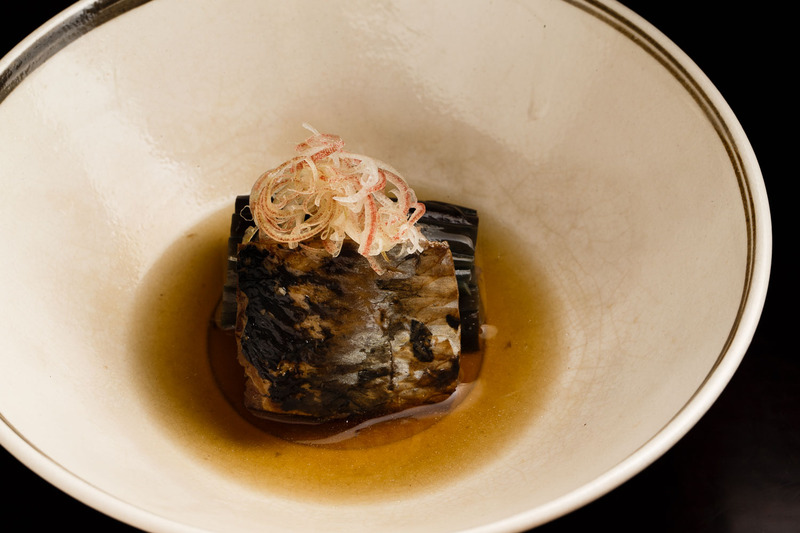 The topping changes with the season as Tsuji selects the pairing of flavors such as fresh bamboo shoots and oigatsuo, or “chasing” bonito, in the spring. Eggplants are wed with sakura shrimp while winter gourd with donko mushrooms. The day’s soup features steamed tilefish with matsutake mushrooms from Bhutan, carefully placed on top of a slice of egg tofu. Infuse yourself in the aromatic vapour as you carefully sip the hot liquid to warm your stomach. 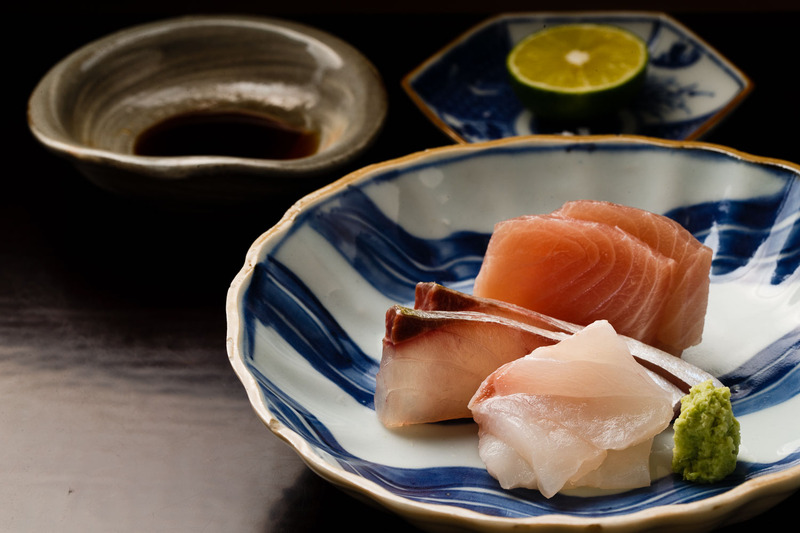 The sashimi plate showcases an assortment of fresh catches and matured fish. Using various techniques from kombujime to searing, the chef brings out the best flavors in each fish. White trevally from Kochi has been resting for two days, while grouper from Niigata is matured for as long as ten days for a deeper flavor. For the grill, he likes to choose rich and fatty fish like nodoguro, hairtail, trout and eel. On the day of our visit, he grills pieces of salt-water eels over crackling charcoal, topped with sansho peppercorn, gingko nuts and tiny mukago potatoes. The rice dish at the end is a celebration of four seasons. 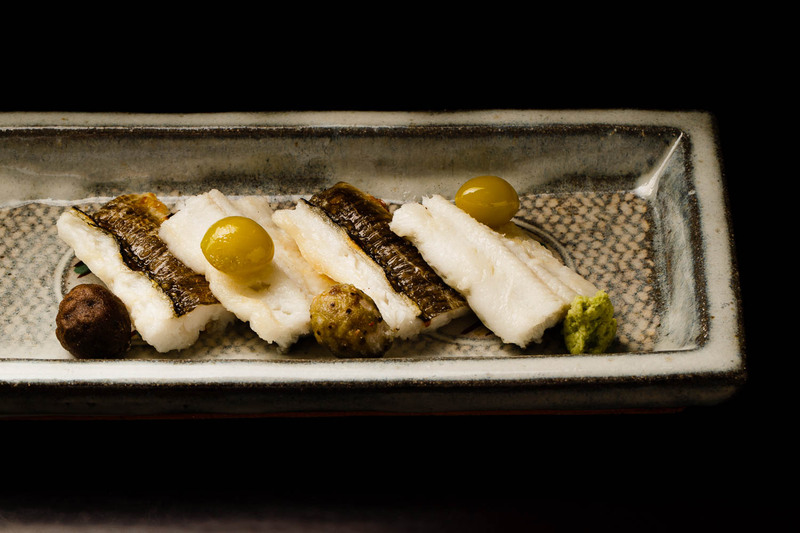 In the spring, the koshihikari grains from Kyoto are cooked with spear squid, squid eggs and butterbur. The summer recipe uses grilled eel, corn and edamame. In the fall, he mixes in wild mushroom and fatty duck. The winter brings snow crabs and Japanese parsley. Naturally, a visit every season becomes a must. Besides quality finds at the Metropolitan Central Wholesale Market, Tsuji buys seasonal delicacies directly from growers across Japan. For wild mushrooms, for example, he picks and chooses among ten or so regions, including some rare picks like ohmomitake and shaka shimeji that many Japanese would not have heard of before. He often goes mushroom picking himself. The kombu seaweed comes from Rishiri Islands while the meats come from a ranch in Chiba Prefecture. The rice is brought from Miyama mountain in Kyoto. They have a wide selection of drinks from sake, wine and shochu. The sake tends to be more with a lighter and dry tone. Most of the wines come from Burgundy. Tsuji was born in the port city of Yokohama in 1983. After finishing university and later a culinary program, he began his training as a chef at a number of established Japanese restaurants. First, he spent two years at Tokyo Kitcho, then at Matsushita in Waseda for three years, Seisoka for two, and another at Kisaku. It was when he was training at Tagetsu he decided he wanted to open his own place. He also had the chance to learn about Japanese artifacts and craftsmanship along the way. “It all just happened naturally,” Tsuji answers softly when asked why he wanted to become a chef in the first place. Modest and humble, the young chef doesn’t say much. He is a lover of antique and unique tableware and often visits museums on his days off. Committed to pursuing originality in his cuisine, Tsuji spends countless hours thinking of new combination and pairings of foods. It’s the most important process in coming up with the seasonal menu, he says. He runs the restaurant with his wife and three other apprentices. He says he is looking forward to the day his students move on to pursue their own dreams. 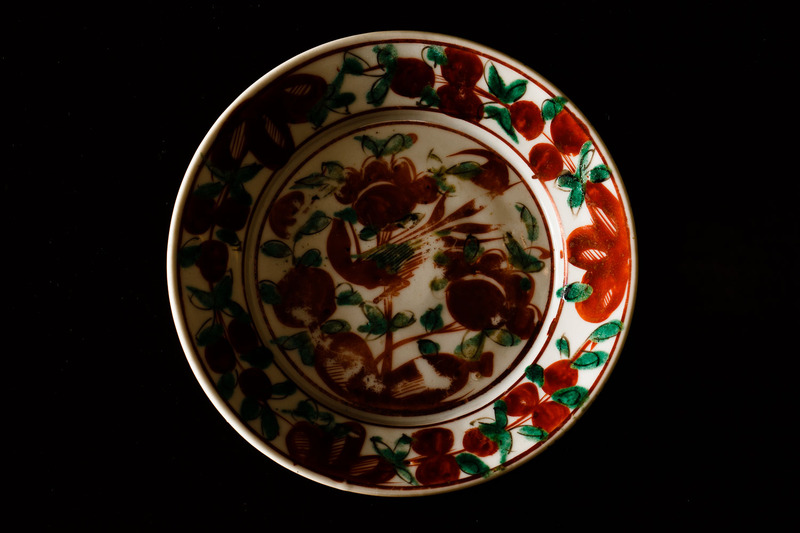 It was during his days at Seisoka that Tsuji discovered his passion for traditional tableware. He gradually began collecting pieces, mostly antiques, which he now uses for the guests at his restaurant. 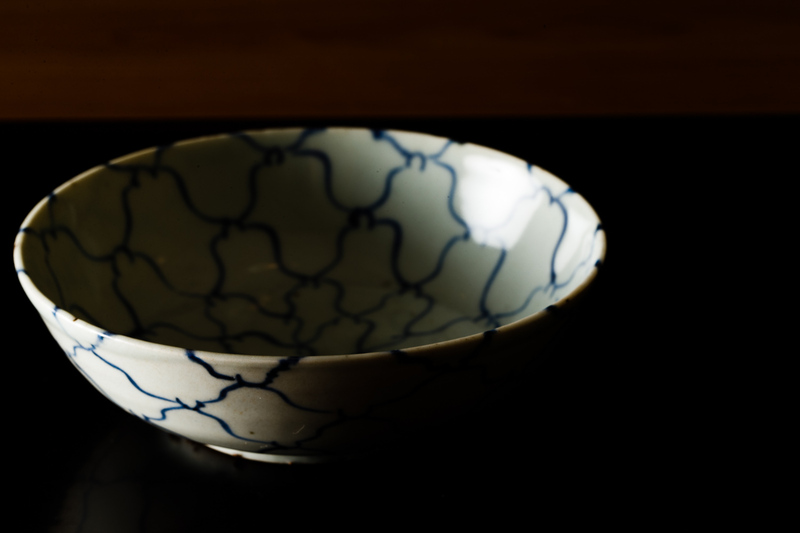 He especially likes the set of five gosu akae ware. Please take a moment to enjoy every plate, bowl and glass placed in front of you.